All software has defects of some sort – we know that. If left unresolved, some defects can have cataclysmic consequences while others are so minor that they go unnoticed by virtually everyone. Like most things in this universe there is a law of diminishing returns when it applies to the correction of software defects. Unless you have unlimited resources to assign to bug fixes, you have to focus your attention on the ones that have the highest ROI. The question is “How do you make those determinations?” There are multiple drivers in any organization that concurrently push and pull the development team in any number of directions. Those drivers could be the Sales Team, QA Team, Finance, End Users, Customers, and Online Media such as Blogs, Twitter and Internet Forums as well as Traditional Media. The list seems endless and all of it is important (or at least most of it is). Some issues are much more important than others and you can bet, if a software defect is featured on prime time TV news broadcasts that it will be the first thing your CEO will want addressed. So assuming you don’t have the media telling your CEO what your top priorities are, you need a process for focusing your attention on the most important things first. While these are the vectors I use, you are welcome to use your own as they may more accurately reflect your specific business reality. The following table provides suggested wording for the ranking of the Scope of a defect. 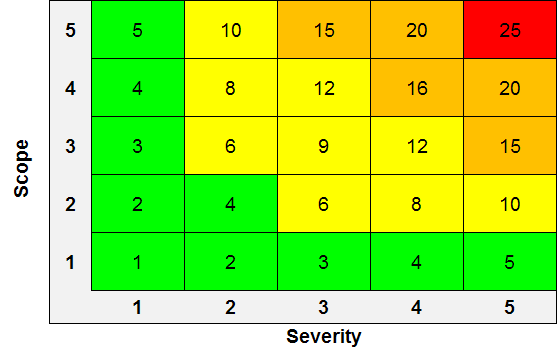 The following table provides suggested wording for the ranking of the Severity of a defect. As I did with the Ranking of Stories, I multiply the two vectors (Scope and Severity) and the product of the two is the Priority. Without a set of predetermined actions associated with each priority range, all that has been accomplished in the shuffling of some paper.This is where many systems seem to fall down. To be effective, appropriate actions must be determined and described. 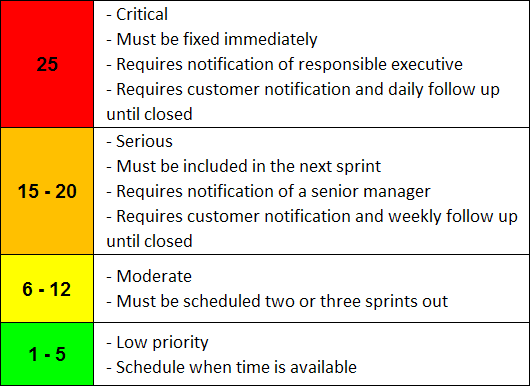 The needs of your organization might be different from mine, and thus the wording you use in your Actions will likely be different. For consistency, I use the same thresholds and the same colour coding as the Story ranking. As with Stories, I print both vectors and the resulting Priority in the top right hand corner of the card and use a highlighter to colour code the card according to the table below. The scale and rankings map directly to the Story rankings and the result is a Defect Card that allows me to easily mix bug fixes into my Backlog with Stories and balance the priorities between the two types. A weakness of most systems I’ve used is that defects and features are ranked using different methods. Doing so makes it difficult to compare the priority of defects relative to features. This system uses the same patterns for both defects and features, but assesses each according to their relevant criteria (vectors), and produces scales that are completely compatible with each other. Consensus on the meaning of the thresholds is important. Selecting the appropriate wording describing the Scope, Severity and Priority may result in wording different than mine. It is also important to keep in mind that it is unrealistic to think that all possible scenarios can be foreseen and described with this system. It is thus important to remember that these are guidelines, not rules. Once agreed upon, however, I have witnessed how the system expedites the assessment process and sidesteps many situations where stakeholders push their agenda as being more important than anyone else’s. Sometimes simply having assessment guidelines (any guidelines) is the most important part of the process, and if nothing else, it can oft times move potentially contentious debates out of the emotional realm into a more empirical one. If you and your stakeholders can at least agree on the basics, and make the process transparent and simple, you’ve made your life and the lives of your team easier. In reality, the lowest category, cosmetic issues, never gets much attention or discussion, so differentiating is not purposeful. I’ve used three levels, and I’ve also used five. My experience is that three levels does not provide sufficient differentiation while five is too granular – your mileage may vary… Irrespective of the number of levels used, the importance thing is that there is an easily understood, and easily managed process in place to provide a means for ranking and managing issues.